Live sound mix by Art Dorety. Another Cold & Rainy Night in Trenton NJ, Nov. 12th, 2002 to be exact. After a short but brutal tour of the U.S. Midwest, the new Millennium Mastermind returned home to kick out the jams at the Conduit Club on a miserable wintry night to a small but enthusiastic crowd dedicated enough to brave the elements. This is a very intimate performance. The 2002 tour to Milwaukee, Chicago, & Cincinnati centering around Halloween saw many setbacks occurr along the way. A blown transmission in the Pennsylvania mountains and sleeping in shopping center parking lots was a true test of medal. The weather was awful but the shows did go on! New band members Tracy McShane and Greg Hagen were quickly indoctrinated to the no label support indie tour lifestyle. Yes indeed, we are crazy. 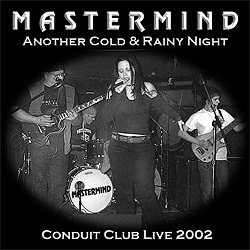 On return home and a week to rest up, the same tour set of classic Mastermind and selections from our Angels of the Apocalypse album is presented here as recorded at the Conduit Club. A decent bootleg recording of unknown origin, we feel this is a good snapshot of the band at the dawn of the new Millennium and hope you enjoy it.